If a PC suddenly fails to boot properly, you should perform a hard reset as the first action. Performing the hard reset will correct many problems. If the computer still does not start properly, select your symptom from the list below to guide you to the recommended corrective actions. 1. Disconnect all peripheral devices and remove all USB devices and SD media cards. You want to test the computer not the accessories! 2. Disconnect the AC power adapter, remove the battery, and then press and hold the power button for at least 15 seconds to drain all residual power and restore default startup settings. 3. Reconnect the AC power adapter (but do not insert the battery), Press the Power button, Look for glowing LEDs near caps lock and num lock keys, and Listen for sounds of a fan or other moving parts turning. Glowing LEDs - when the power button is pressed - indicate that electrical power is available to the computer's system board. If the computer does not start, the LED lights do not glow, and the display is black, you can perform one or more of the following actions to resolve the no power issue. Verify the computer is receiving power from the AC adapter . Use a different AC power adapter . CAUTION: Using a power adapter that does not meet the power requirements or has the wrong type of connector may damage the computer. On newer notebook models, connecting the wrong adapter to the notebook may cause the power LED lights to blink but not power the computer. Remove the battery and boot on AC power only . If LEDS do not glow and the fan or hard drive do not spin, AC adapter may need to be replaced. If LEDs glow and PC boots, the battery may need to be replaced. If LEDs glow but PC does not boot, go to LEDs glow, fan is heard, but display is black or blank section. Remove the AC adapter and boot on battery power only . If LEDS do not glow and the fan or hard drive do not spin, battery may need to be replaced. If tests of both the battery and the AC adapter fail, there may be a problem with system board requiring service by HP. If LEDs glow and PC boots, the AC adapter may need to be replaced. If LEDs glow, but PC does not boot go to LEDs glow, fan is heard, but display is black or blank section. On older computer models, the startup diagnostics use a series of tones (beeps) to identify an error codes. If you hear beep tones (usually 1 - 6 tones), contact HP to report the number and duration of the tones, and receive technical assistance. On HP Pavilion and Compaq Presario notebook computers built in 2009 or later, the startup diagnostics use blinking LEDS to identify errors. If you see the LEDs near the caps lock or num lock keys blinking (usually 1 - 8 blinks in a series), contact HP for assistance. Blink codes and beep tone codes have a similar purpose but the number of blinks or beeps do not indicate the same error conditions. The codes are specific to individual models, and you will need to know your exact notebook model number. 1. Press the power button to turn on the computer and look for blinking LED lights on the keyboard, or listen for beep tone. 2. Count the number of blinks or beeps in the sequence. 3. Contact HP for technical assistance, and report the number of blinks, or beep tones. You must also know the exact model or product name of your computer. If you have just replaced any internal hardware components (memory modules, hard drive, etc.) and you experience a blink or beep code, the component may not be connected properly. To physically check the connections and correct this problem, you should remove and reseat the new components. If the LED lights glow and a fan noise is heard, but the display remains black and the computer will not start, you can perform one or more of the following actions to resolve this startup issue. If you have not performed the required hard reset, do it now! Hard Reset ! Disconnect any peripheral devices, remove all SD cards, CD/DVD discs, USB devices, and performed a hard reset to restore the default setting! Disconnect the AC and battery power. Press and hold the power button for at least 15 seconds . If there is a problem with the LCD display's back light or a corrupted graphics driver, the display may appear blank but the notebook may be working. Attach an external monitor to test the display. If the image displays on the external monitor, there may be a graphics driver conflict. To resolve this, turn on the computer and press f8 key, then select Enable low-resolution video . If the image displays in low resolution on the LCD display, you can download and install the latest drivers for your specific graphics driver. If an image does not display on the notebook, contact HP for technical assistance. If the computer appears to try to start but then stops responding, there may be a loose internal connection. Loose connections commonly occurs when a hardware component, such as memory module or bootable hard drive or disc, is installed improperly, or is not compatible with the computer, or the computer was dropped or jarred. Do each of the following actions and then attempt to restart the computer. Remove any new parts and reinstall the original components. If you install the new components one at a time, you can to determine if one of the new components is defective. If you installed multiple memory modules, remove the modules and then install one module in a memory slot and try to restart the computer. If computer does not start, move the memory module to other slot and try again. Repeat this action and test the other memory module in each memory slot. If there is power to the notebook, you may be able to access the BIOS or the EFI to run memory and hard drive diagnostic tests. Perform each action and then attempt to reboot the computer. If you cannot access a diagnostics screen, it may be necessary to recover the computer to its original condition. Select Reset the BIOS to default condition (f9) . Select Perform a Primary Hard Disk Self Test . Select Perform a Memory self test . Select BIOS Setup (f10) , then select Reset the BIOS to default condition (f9) . 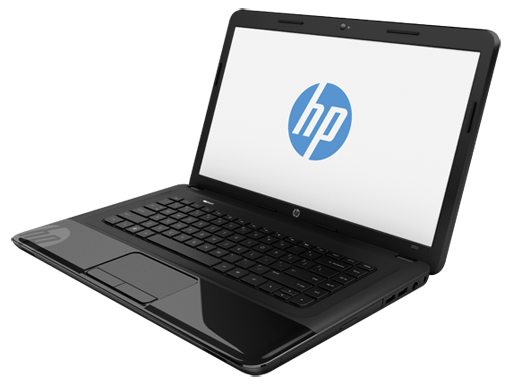 For more information on the EFI environment, see the HP Notebook PCs Startup & No-Boot web page. If the computer is not responding (1) AFTER you performed all of the other corrective actions in this document, (2) AND if you have the operating system recovery discs, (3) AND if the computer can access the DVD drive, you can restore the computer to its original factory condition. Depending on the condition of the hard drive, the recovery utility may allow you to make a backup of all of your personal files because performing a system recovery. For more information, please see Repairing or Reinstalling the Operating System . In some cases, the computer may operate properly in Windows but suddenly crash when you start or exit a program. Problems that cause a blue screen error usually display a specific message and have a specific solution. The computer can usually be restarted by turning the power off and then on, but ignoring the error message does not resolve a reoccurring problem. It may appear that there is no error message if the computer is set to automatically restart when an error is detected. This setting can be changed and when the specific blue screen error message is displayed, use a computer with access to the internet to search the following web sites for solutions to the specific error message. If no error message is displayed, and the computer cannot boot into Windows, do the following to disable the automatic restart feature in the Advanced Boot Option. NOTE: For Windows XP, to disable the automatic restart on system failure feature, install XP service pack 2 or later. If you cannot search on a specific error message, perform one or more of the following common actions to resolve blue screen error messages . If the computer displays a blue screen and stops responding, you can perform one or more of the following actions to resolve the startup or no boot issue. In some cases, if there is power to the notebook, you may be able to access the BIOS, or EFI diagnostics, and run memory and hard drive tests. If you cannot access a diagnostics screen, try one of the other actions listed in this section. If computer does not boot into Windows, turn on the power and press f8 . On the Windows Advanced Boot Option screen, select one or more of the following options. Select them one at a time and press the enter key to attempt a system restart. Boot into Safe Mode and then Uninstall recently installed software programs . When in the computer is running in the Safe mode, click Start , Control Panel , and select the Uninstall a program option. When the computer is operating again, go to program manufacturer's web site for support information. Click Start , All Programs , Accessories , System Tools , System Restore . Select a windows restore point from a time when the computer operated properly, and then restart the computer. Click Start, type restore in the search field, and select System Restore from the list. Select a windows restore point from a time when the computer operated properly, and then restart the computer. If the computer does not boot into Windows, you can restore the computer settings to an earlier point in time. Turn on the power and press f8 . On the Windows Advanced Boot Option screen, select Safe Mode and boot into Windows. The Windows logo may appear on a blank screen or a specific error message is displayed. The computer can usually be restarted by turning the power off and on. With Windows Vista and Windows 7, the computer may prompt you to select a Windows Startup Repair option when the power button is pressed again after a startup error. Use Windows Advanced Boot Options to start the computer . Select Safe Mode and then Uninstall recently installed software programs . Restore the BIOS defaults . To reset the BIOS configuration to its default condition, turn on the computer and press f10 to enter the BIOS setup , and then press f9 key to reset the BIOS defaults option. Restore the default VGA Low-Resolution graphics settings . If there is a graphics driver conflict, turn on the computer and press f8 key, then select Enable low-resolution video . This allows you to download and install the latest graphics drivers. Once the correct driver is installed you can select the desired resolution. Run an anti-virus program . Search for and remove any virus or malware. Test the hard drive . The HP Hard Drive Self Test can repair most errors. Turn on the computer and press f10 to boot into the BIOS Setup and select Hard Disk Test . Restore the system to a known good configuration using Microsoft System Restore . Turn on the computer and press f8 and then select Boot into Safe Mode . When in Windows, click Start , type Restore in the search field and select System Restore . Select a restore point when the computer was operating properly.